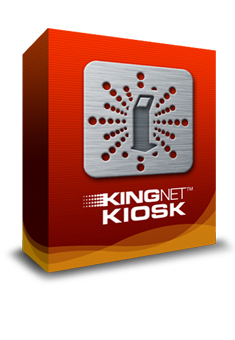 KINGnet Kiosk is a secure software package providing the foundation of any public access kiosk solution. Includes a complete solution for safe web browsing with user attract screens. In addition to the robust health monitoring, update management and security KINGnet Kiosk provides a starter solution with access to local or remote web and rich media content. Full Screen Locked-down captive web browser for public space - replaces all browser controls and navigation user interface with public-ready components, preventing the user to access or change browser or system settings. Privacy - All user information, cookies and session information are removed as soon as the user session is over. Ad-ware blocked: All pop-ups that are not authorized by the configuration are blocked. Boot Control and OS lock-down - Users cannot access the underlying operating system or bios. All key combinations and menus are controlled.